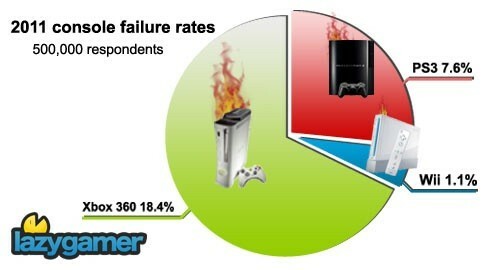 Console failure rate survey: with a pie chart and everything. A recent survey conducted over a 232 day period, with a total of 500,000 submissions at a 1 in every 3 person basis, has collected some interesting data with regards to console failure statistics over the last year. 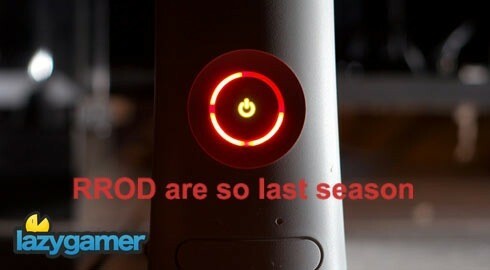 According to the analysis conducted by No fuss Reviews and affiliates, the Xbox 360 failure rate has decreased significantly over the last year, dropping from a 42.4% percent failure rate in 2010, to an 18.4% in 2011. Furthermore it would appear that both Sony and Microsoft’s slim models have proven to be far superior to previous models in terms of reliability, with neither console exceeding a 1.2% failure rate over the last year. The surveys 500,000 people were broken down into smaller demographics according to questions answered in relation to specific consoles. The result was that 38% answered questions relating to the PS3, 32% spoke for the Wii and 30% were quizzed about the Xbox 360. While the numbers suggest that the 360 is loosing by a 10.8% failure margin over its rival Sony, this could be expected considering the 360 had a good lead on the PS3 for a while, in terms of global sales. Overall, if the analysis is correct Nintendo consoles, are holding on to their hallowed position, as the most reliable console over the last year, even with a 1.09% increase in failure rates since the previous recording. On a good note, regardless of console preference, it would seem as though the slightly newer consoles have managed to rid themselves of some of the issues that plagued their predecessors, which is excellent news if these statistics are anything to go by. The bad news is, if like me you foolishly ran out and bought one of these fantastic happy machines when they cost a lot more and were a bit bigger, none of the good news above really applies to you. Unless, you are a Wii only kind of person of course, in which case the news always seems to be good. Is there a PlayStation 4 hardware disaster looming?